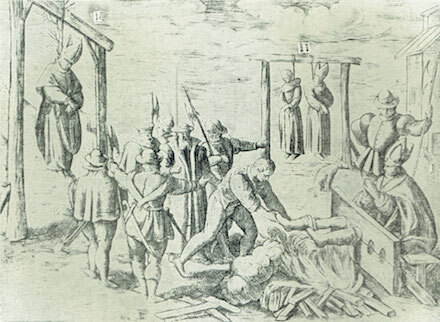 On this date in 1612,* Bishop Conor O’Devan(e)y and Father Patrick O’Loughran were hanged, drawn, and quartered as traitors at George’s Hill outside of Dublin. In the wake of the Gunpowder Plot, Ireland’s Catholics found things increasingly uncomfortable under King James. In 1607, reacting to a squeeze on their incomes and prerogatives, two native noblemen fled to the continent hoping to make arrangements with the Spanish for a reconquest that would never come. This Flight of the Earls spelled the end of Ireland’s homegrown Gaelic aristocracy and set the stage for the Plantation of Ulster, the settler statelet that formed the germ of present-day Northern Ireland. O’Loughran’s crime was very simple: already on the continent himself, he had administered the sacraments to those attainted fugitives, later having the boldness to return to Ireland. There, the charge of collaborating with Bishop O’Devany was also laid to his shoulders. While O’Loughran was in the summer of his natural life, O’Devany was around eighty years old. Consecrated a bishop in Rome in 1582, he had returned to the north of Ireland and been briefly detained in the post-Spanish Armada security scare. In the 1600s, O’Devany’s protector had been Hugh O’Neill, Earl of Tyronne, and unfortunately this man was one of the earls in the aforementioned Flight. He wasn’t a difficult man to target, but the somewhat gratuitous decision by England’s viceroy to do so was not widely supported even by the English and Protestant factions. O’Loughran’s conduct could perhaps be stretched to resemble treason; O’Devany was just an old man being persecuted for his faith. Going to his glory, the bishop did not fail to play that angle up under the eyes of a sympathetic Gaelic crowd. 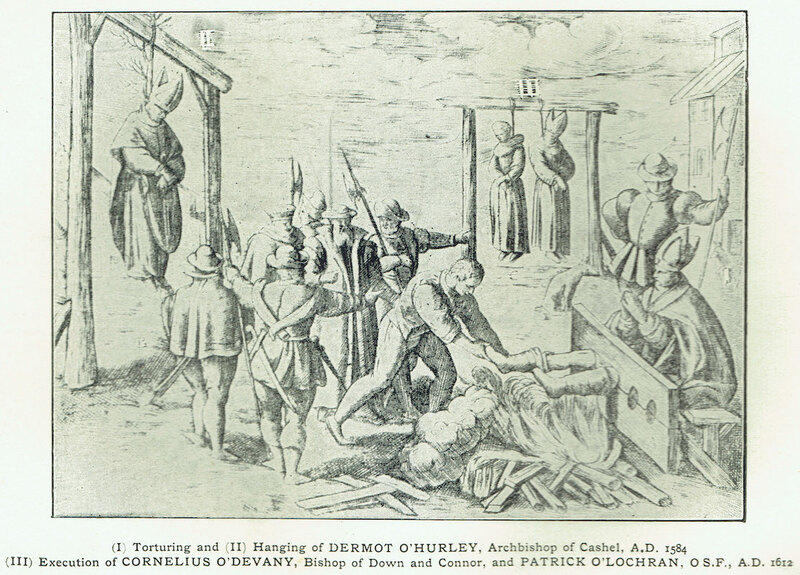 This image counterposes O’Devany and O’Loughran (background) with the sufferings of 16th century martyr Archbishop Dermot O’Hurley (foreground). Thanks to the counterproductive outcome, the British laid off the policy of martyring Catholic priests thereafter (at least until Cromwell, but that’s another story). Both men were beatified in 1992 among the Irish Catholic Martyrs. * The date was February 1 according to the Julian calendar still in use by England at the time; it was February 12 according to the Gregorian calendar. England occupied Ireland through the period of the new Gregorian calendar’s initial 16th century adoption by Europe’s Catholic countries, so the official date in Ireland was February 1 … even though the padres’ boss in Rome would have considered it February 12.